I’ve gotten my hands on three albums with the Swiss trio: Vein. On the latest from 2012 they are in the company of American sax-legend Dave Liebman, while the others are live recordings and an interpretation of Gershwin’s classic: Porgy & Bess. The trio has a very wild attack and is characteristic in that way – like a European version of The Bad Plus without any further comparisons. As an old Gershwin fan and especially a fan of Porgy & Bess it is always exciting to hear new versions of the well known melodies. And you do find Gershwin material on all three albums. The Liebman album has a fiery version of Summertime as well as a tremendous version of Dave Brubecks’ In You Own Sweet Way. Vein is Thomas Lähns, bass – Michael Arbenz, piano – Florian Arbenz, drums. 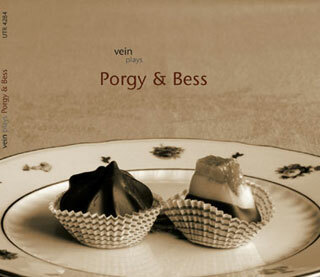 The trio has an energetic approach to Porgy & Bess. In a relaxed and informal way, they show how the classical musical also can be played. The trio is not held back by the tight strings of the melodies. They go freely in the material and without tramping anything down. Their own material is o.k. but my interest in their melodies weakens when they are next to these old, strong ones of Gershwin.